Wallingford, Connecticut. January 24, 2013. Amphenol Corporation (NYSE-APH) confirmed today that its Board of Directors approved the first quarter 2013 dividend on its Common Stock in the amount of $.105 per share at its meeting held on January 23, 2013. The Company will pay this first quarter 2013 dividend on or about April 3, 2013 to shareholders of record as of March 13, 2012. 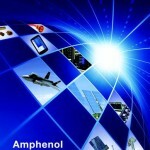 Amphenol Corporation is one of the world’s leading producers of electronic and fiber optic connectors, cable and interconnect systems. Amphenol products are engineered and manufactured in the Americas, Europe, Asia and Africa and sold by a worldwide sales and marketing organization. Amphenol has a diversified presence as a leader in high growth segments of the interconnect market including: Military, Commercial Aerospace,Automotive, Broadband Communication, Industrial, Information Technology and Data Communications Equipment, Mobile Devices and Wireless Infrastructure.